Inspired to begin working from within to achieve true transformation? Apply to become part of the Bestow family as an approved stockist. 1. 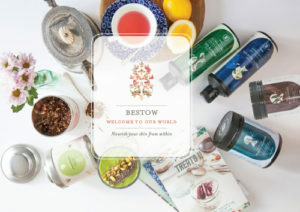 Download the Bestow Welcome to our World Information Pack. 5. On completion of Bestow University training programme your ‘Bestow Opening Order’ will be emailed for confirmation and payment before dispatch. 6. Be loaded onto our website and in our mail system. 7. Receive your Opening Order including gift for completing Bestow University and marketing materials from Bestow HQ. 8. Enjoy introducing Bestow to your clients and learning to work from within! What product ranges does your clinic currently stock? What is your clinics skincare philosophy and what appeals to you about Bestow? Payment before dispatch is required for the opening order. If you would like to pay by credit card please select below (this has a 2% non-card holder present fee). For following orders payment is required by the 20th of the month following. Please note your opening order we have sent freight free, however orders after this will incur a small freight charge. We do a lot of communication via email, please fill in the email address(s) you would like to receive the following types of communication.